NYC is known for its skylines, landmarks, and tourist destinations. We are often in the city on business, and so we do not often taken advantage of the opportunities to the sights. In the past, readers have suggested it would be interesting for us to do a series on some points of NYC interest. We gave the request some thought and decided we will, on each trip down, take some time out and visit one POI. One of NYC’s most famous icons is the Brooklyn Bridge. The bridge connects the lower part of Long Island with the Financial District at the southern tip of Manhattan. 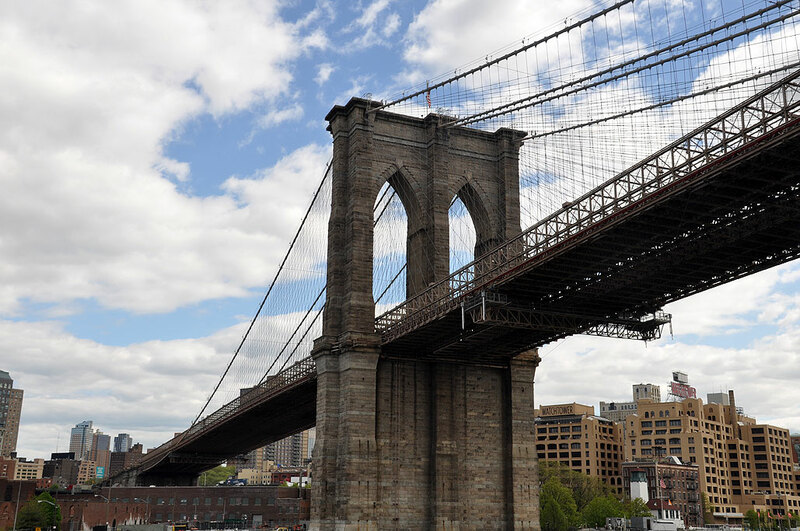 The Brooklyn Bridge is one of the oldest suspension bridges in the United States. 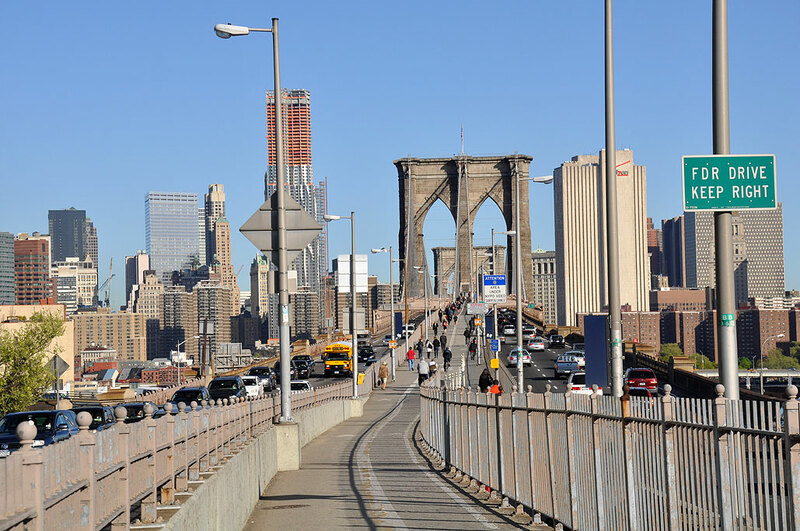 Completed in 1883, it spans the East River. At 5,989 feet (1825 m) it was the longest suspension bridge in the world from its opening until 1903, and the first steel-wire suspension bridge. On this visit, we stayed at the Marriot in Brooklyn so we could walk across the bridge into the city in the morning. Our walk started from the Brooklyn side. There were plenty of interesting things to see both on the bridge and on the water. We glimpsed both the Manhattan Bridge as well as the Statue of Liberty. There was a haze, but we could still see the reflection of the sunlight on the tip of the torch. At 8AM the foot traffic was light, but the vehicular traffic was already quite robust. Most of the folks we encountered were joggers and cyclist out for their morning workout. Seeing the Brooklyn Bridge on foot is a totally different experience than driving across it in a car. When you are on foot, you can stop and touch the rivets, feel the thickness of the steel cables, and sense the vibration of the cars as they pass by underneath your feet. You can also look up and take in the patterns made by the suspension lines. All of this was missed by those rushing across on their way to their day’s obligations. There was no charge for walking across the bridge. The trek was up close and personal and a great way to experience this NYC icon. There are, of course, many other ways (ferry, helicopter) to take in the majesty of this incredible feat of engineering. When the weather is warmer, we will go back and see it at night. With the Manhattan skyline as a backdrop, we are certain it will be quite spectacular.